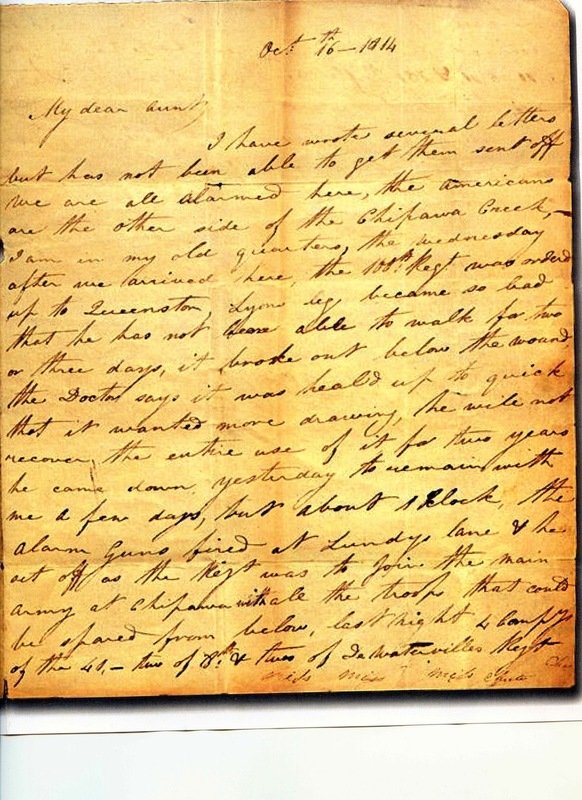 The following letter was written by Catherine on the above date while she stayed at Chippawa in 1814 during the Battle of Chippawa Creek, one of the battles of the War of 1812. In early times, it was common for the wives of officers to accompany their husbands to the battles, staying in the fortresses or encampments and nursing the wounded among other duties. The Lyons had just returned to Chippawa with George having just recovered from severe wounds suffered in an earlier battle there. It is amazing that a girl of that time born in 1793, writes so well with only home schooling at a military out post. This letter was found in a desk drawer in Toronto (York) in 1910 when desks were being cleared to move into the new Queen’s Park offices of the Government of Ontario, 96 years after its writing. The letter was written to and addressed to “Mrs. Ridout, York, Upper Canada”, the aunt of Catherine Lyon. 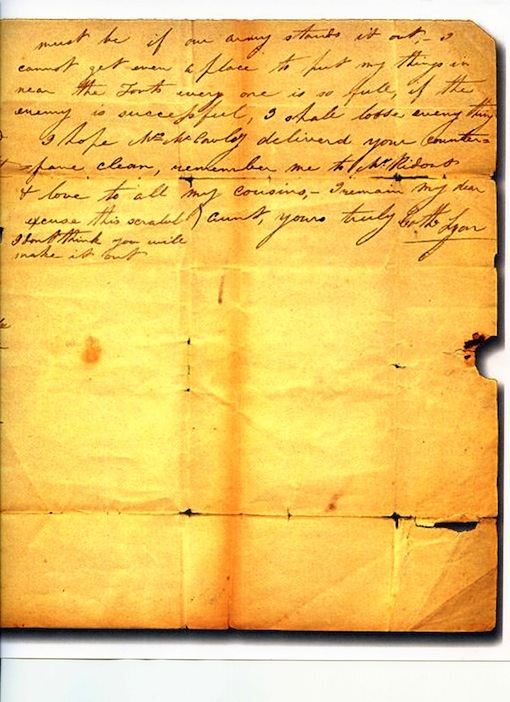 The Ridouts were government civil servants and obviously the letter was found in the desk of a family member. Thanks to Kurt Johnson, researcher and a director of the Goulbourn Museum, who helped locate the letter in the Ontario Archives . For ease of reading, a typed version of the letter is provided. I have wrote several letters but has not been able to get them sent off. We are all alarmed here, the Americans are on the other side of the Chipawa Creek, I am in my old quarters, the Wednesday after we arrived here, the 100th Regt. was ordered up to Queenston, Lyon’s leg became so bad that he has not been able to walk for two or three days, it broke out below the wound, the Doctor says it was healed up to quick that it wanted more drawing, he will not recover the entire use of it for two years, he came down yesterday to remain with me a few days, but about 1 o’clock, the alarm guns fired at Lundys lane and he set off as the Regt was to join the main army at Chipawa with all the troops that could be spared from below, last night 4 Company of the 41, – two of 78th and three of deWatervilles Regt marched up out of the Forts – the Yankees received last week a reinforcement of 4000 – 500, and 100 Rifle men it is said by the Deserters that has been coming in every day, they now have between nine and eleven thousand. 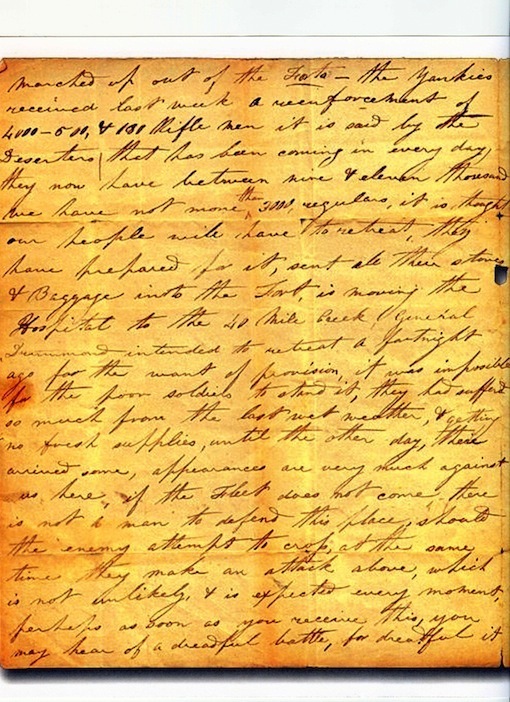 We have not more than 3000 regulars, it is thought our people will have to retreat, they have prepared for it, sent all their stores and baggage into the Fort, is moving the Hospital to the 40 Mile Creek, General Drummond intended to retreat a fortnight ago for want of provision, it was impossible for the poor soldiers to stand it, they had suffered so much from the last wet weather, and getting no fresh supplies, until the other day, there arrived some, appearances are very much against us here, if the Fleet does not come there is not a man to defend this place, should the enemy attempt to cross, at the same time they make an attack above, which is not unlikely, and is expected every moment, perhaps as soon as you receive this, you may hear of a dreadful battle, for dreadful it must be if our army stands it out, I cannot get even a place to put my things in near the Forts every one is so full, if the enemy is successful, I shall lose every thing. Excuse the scrawl, I don’t think you will make it out. This entry was posted in Personalities and tagged Lyon, War of 1812. Bookmark the permalink. I believe that the unknown word on the last page is pane. It looks like counter = pane. This would make the most sense to me. A counterpane was a bedspread.